Entry is £1.00 and includes a drink and a mince pie. Join us between 10.00am and 2.00pm as part of the Oldham Heritage Days. There will be displays of photos and historical documents available for you to learn more about our history and the history of our area. Lunches will be served from 12.00pm. There will be a selection of soup, sandwiches, salad, quiche and cakes available. Today we are sharing our first joint service with our friends from Hope Methodist Church in Failsworth. They will be sharing with us over the coming months whilst their building is undergoing renovations. We look forward to sharing with you and getting to know you all. Join us on Saturday 10th February 2018 at 6.30pm for an all-age quiz based on the events of 2017. Everyone welcome. Donations made to the work of the Church. We are holding a special service at 7.30pm to meet the needs of people who are feeling down at Christmas. This service will be reflective, accepting where we really are and holding out healing and hope. This year the annual Failsworth Carnival is taking place over the weekend of the 20th and 21st May 2017. The parade leaves Lord Lane Playing Fields at 1.00pm and passes our premises at approximately 1.10pm. We will be open and handing out bottles of water to passers by and members of the Carnival procession. Please note there will be no Church Breakfast served on the last Sunday in December. Please join us again for this on the last Sunday in January 2017. Well folks, its now officially Summer Time and once again we will be holding 4 activity mornings through the summer holidays for children aged 11 and under. Please see the attached flyer for more information and booking details. We are advertising for the position of a Community Worker within our Church. Please see the attached Advert and Job Description. Closing date 30th June 2016. For further information and a job pack please e-mail office@romanroadimchurch.org.uk or call Elizabeth Barron on 0161 688 4129. We are pleased to announce that we have booked another teaching weekend with Ken Hepworth on "Inner Healing and Emotional Wholeness". This will take place on Saturday 13th & Sunday 14th February 2016 here at Roman Road IM Church. The Saturday session will begin at 9.30am and will cost £2.00 per person. Phone : 0161 682 4761 and leaving a message. Join us this Sunday for our monthly Church Breakfast, where you will receive a warm welcome. Selection of cereals, fruits, yoghurt,, juices and hot breakfast items available. Food served from 8.40am to 9.30am. Join us for a very special event with our special guest Ken Hepworth and an Introduction to the Healing Ministry of Jesus. Saturday 18th and Sunday 19th July 2015. Join us on Wednesday 26th November 2014 from 1.30pm to 3.30pm for our Annual WOW Christmas Market. All proceeds go directly into WOW funds, our vulnerable adults group. Come and join us at the Launch Event for this Oldham wide initiative. A great night of worship, prayer and inspiration with details for the next 6 months of the Its Jesus initiative. There is no need to book tickets just turn up on the night! North Canvas is an exciting community based project in Oldham that uses drama, music and video to explore biblical themes. 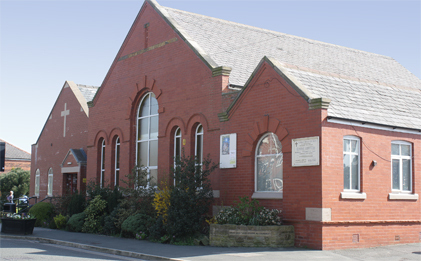 Last year they ran a succesful drama workshop at East Oldham Methodist Church in Oldham, and we then decided to invite them to Roman Road to lead us in a similar programme of drama workshops. Just because its the summer holidays doesn't mean we haven't been busy here at Roman Road. We have been running a series of Activity Mornings for children and their carers once a week on a Thursday morning with up to 30 children attending each session. The themes for these sessions have been Homes, Families, Food and Clothes. At each session the children were able to paint, make things, cooking, play with toys and watch a film all based on the theme. Come along to Take a break on Tuesday at 10:30am and meet Valerie who makes and sells ‘The ladies of Grace’ – beautiful hand stitched dolls inspired by great women of the Bible. Each doll has been carefully designed and hand stitched with beautifully selected fabrics and wools. There are six ladies to choose from and a choice of dresses and hand knitted cardigans. Starting Wednesday 16th January 2013 at 10.00am here at Roman Road IM Church, Failsworth. The Christianity Explored course gives you time and space to think through who Jesus is and why it matters. A huge variety of people, with different experiences and backgrounds, and different views and beliefs, come on the CE course. This course will take place each Wednesday and will run for 8 weeks. Our annual Christmas Coffee Morning took place on Tuesday 20th November 2012. There was a great array of things available for sale including home bake, jewellry, stocking fillers, handmade cards and gifts together with refreshments being served by our wonderful volunteers. Many thanks to all those who supported the event by purchasing gifts and goods, and to those who volunteered and made the event a huge success. The funeral of Clifford Ward will take place at Roman Road IM Church on Friday 23rd November at 1.00pm. Followed by Commital at Hollinwood Crematorium at 2.30pm. Light refreshments will be available at Roman Road IM Church following the Commital service. Family flowers only. Donation in lieu to Springhill Hospice. Have you been to any of the Children's Activity Morning's this summer? Do you want to find out what you've been missing? The Oldham Foodbank now have a permanent premises at 24 Clegg Street, Oldham, OL1 1PL. They are open Tuesday to Thursday from 11am to 2pm and Friday from 11am to 4pm. Who Let The Dads Out? In Failsworth! During the summer holidays we are holding 4 "Get, Set, Go!" themed activity sessions for children, under 11, & carers. These will take place on Thursday mornings from 10.00am to 12.00pm, on the 26th July, 2nd August, 9th August and 16th August 2012. During each of these activity sessions the children will take part in crafts and activities based on the "Get, Set, Go!" theme. The Diamond Jubilee Celebrations started at Roman Road on Sunday 3rd June when we took part in the Big Lunch and shared a faith buffet after the service. On Monday evening a number of us joined with friends from the parish church St Johns along with our local MP and councillors for a short service and to light the beacon for Failsworth in the church grounds at 10.15pm before the Queen lit the final beacon at the end of the Jubilee concert at 10.45pm. Clifford, Dorothy and Paul attended the Ministers conference at Bawtry Hall on the 11th & 12th May 2012. The speaker was Mark Green from LICC (London Institute of Contemporary Christianity), who we managed to get a photo opportunity with at the conference. We celebrated our Anniversary on Sunday 19th May 2012 with a special service, led by Rachel Lawson, Worship Group Leader and musician. At this special service we also launched this, our new website, which we hope will be a valuable tool in our future. A photo opportunity was seized to mark this special occasion. Oldham FoodBank is an Oldham wide initiative sponsored by St Margarets Church, Hollinwood, and currently based there. Many Churches in the Oldham area are backing this, including Roman Road IM Church, by collecting food and joining with volunteers to man the centre. Dads and their toddlers are invited to a brand new group starting here, at Roman Road IM Church on 7th July 2012 from 10.30am to 12.00pm. The group, called ‘Who Let The Dads Out?’ is run along the same lines as traditional parent and toddler groups, but is specifically for fathers, grandads or male carers and their children.